Cream the sugar, margarine and vanilla until light and fluffy. Add the eggs, one at a time, beating well after each egg. Sift together the flour and baking powder and add to wet mixture. Mix well. Spread 2/3 batter on greased cookie sheet. Spoon on can of cherry pie filling. Top with remaining batter, swirling the batter some. Bake at 350 degrees F for 25-35 minutes. 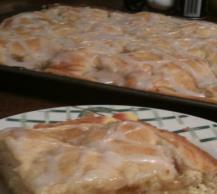 After cooled, drizzle glaze over entire dessert.